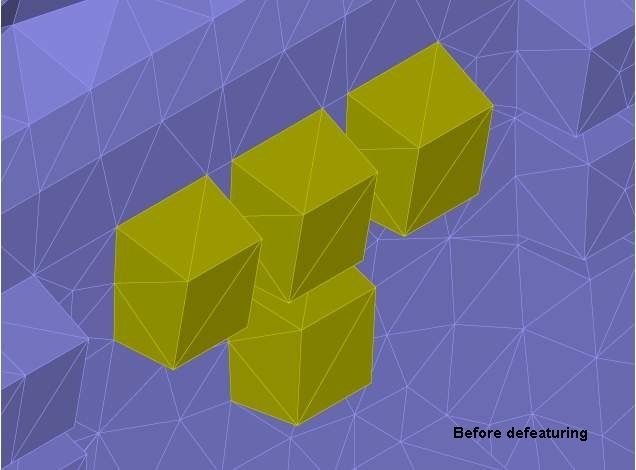 The BODY CLEANUP tool presented in the last News is used to remove small faces and edges from the geometry body before meshing. 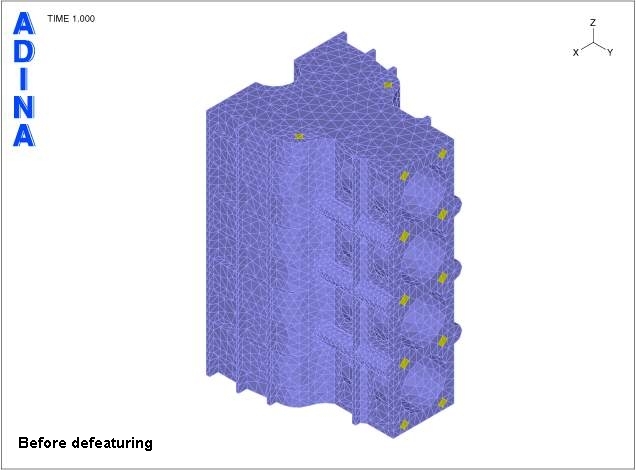 It works directly on the geometry body and all meshing options can be used. 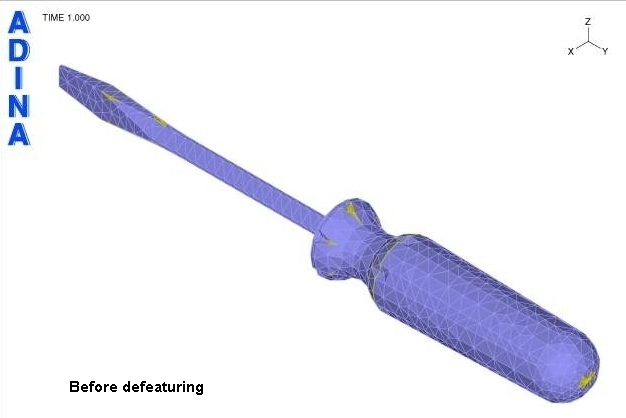 To remove larger features, including protrusions and holes, which are not relevant to the analysis, the BODY DEFEATURE tool can be used to obtain a more effective mesh for analysis. 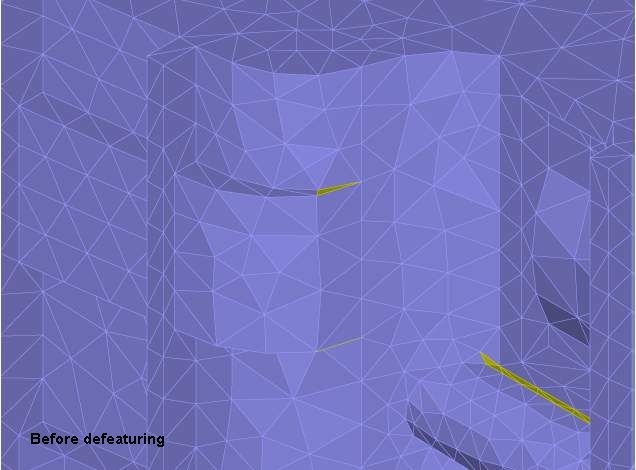 The BODY DEFEATURE tool, available in ADINA 8.3, works on the boundary discrete representation (surface triangular mesh) on a body. Typically, the features to be removed are given as a list of faces in the input. For example, to remove a cylindrical hole, the two faces of the hole are specified. The user can also specify a minimum length where any surface triangle below the length will be removed, except for faces which are identified to be excluded from modification. Below, we show three examples of the use of the BODY DEFEATURE tool. In the following boundary discrete representation, the holes to be removed are shown in yellow. Moving your mouse onto the mesh will display the mesh after the BODY DEFEATURE tool has been applied. Moving your mouse away from the mesh restores the original mesh. 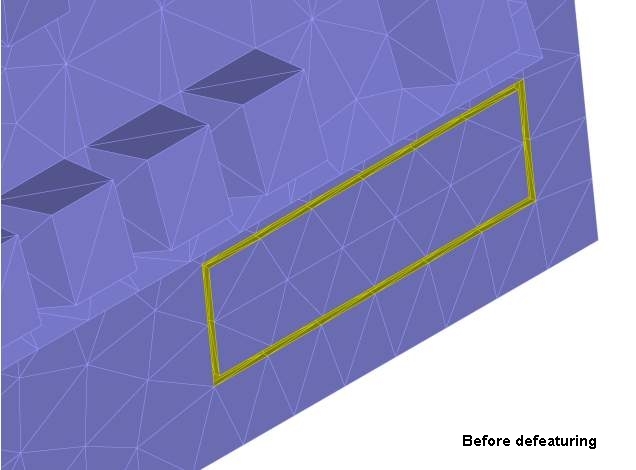 The BODY DEFEATURE tool is also used to remove triangles in the surface mesh that are below a specified minimum length (shown in yellow below). If you move your mouse onto the mesh, you will see the effect of the BODY DEFEATURE tool. 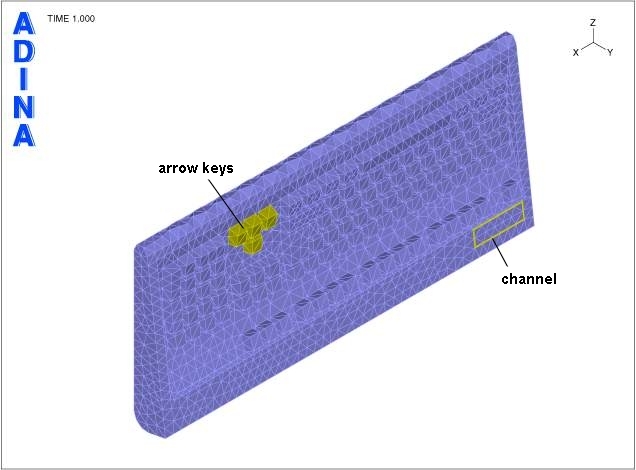 The mesh plot of a keyboard is shown below. The features to be removed are colored yellow -- the arrow keys and the channel surrounding the manufacturer's label. Following is a detail of the mesh around the arrow keys. The features to be removed are shown in yellow. If you move your mouse onto the mesh, you will see the effect of the BODY DEFEATURE tool. A detail of the mesh around the manufacturer's label area is shown below. The feature to be removed -- the channel around the label -- is shown in yellow. As before, move your mouse onto the mesh to see the effect of the BODY DEFEATURE tool on the mesh, and move it away to restore the original mesh. The features to be removed are shown in yellow. Move your mouse onto the mesh to see the effect of the BODY DEFEATURE tool.